1. 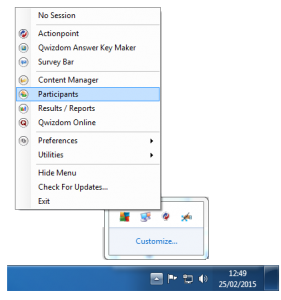 Click the Qwizdom Tools icon at the bottom right of the system tray, and select “Participants”. 2. 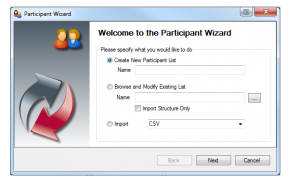 The Participant Wizard window will appear. Choose Create New Participant List, enter a class / file name, then click Next. 3. When the Template Selection appears, click Educational/Corporate as appropriate, then Next. Three items are required in the Selected Fields box (First Name, Last Name, and Participant ID). 4. 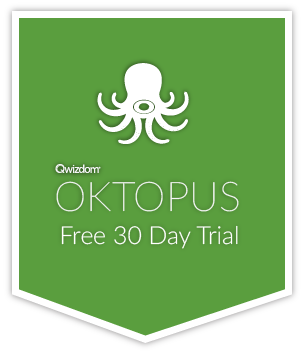 Click Next to begin entering student information. 5. Enter First Name, Last Name, and Participant ID number. The Participant ID number can be used for student login, can be up to 15 digits. Please note that the Participant ID number needs to be numeric. It cannot include symbols or alphanumeric sequences. The Remote number will auto generate, but can be overridden. It is recommended that the Participant ID and the remote number match, to avoid any potential confusion. 6. Click Finish. The QPL (Qwizdom Participant List) file generated by the process can be imported into the Presentation Setup screen.